Excitement of developing the new technology is constantly rising. More and more people are being involved into the chaos around Ethereum. And while someone say that it is just another bubble, most people believe that we’ve become witnesses of the birth of the new Internet, which is more secure, transparent, and user-friendly – just as it was planned in the beginning. 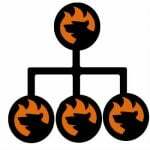 Here at Firebear we can’t stay silent about the new digital revolution, so here is our second post dedicated to the new blockchain technology. Below, we shed light on where to buy Ethereum in the most safe and fastest manner. What Ethereum exchange to choose? How to buy Ethereum with PayPal? How to sell Ethereum? You will find answers to these and other questions in the following post. We describe 5 time- and community proven digital asset exchange companies that allow to sell/buy Ethereum. And the first one is Coinbase – the easiest place to buy, use, and accept Ethereum, Litecoin, and of course Bitcoin. Founded in June 2012, Coinbase is now one of the safest and most secure places to trade cryptocurrencies. It currently offers two platforms: Global Digital Asset Exchange or GDAX for professional traders and Coinbase for retail exchange of Ether and other coins for fiat currency. But is Coinbase save, you will ask? It is safe for 100%. Almost 8 million people trust the platform and their amount is constantly growing. Also note that $6.0B were exchanged in digital currencies on Coinbase. 98% of customer funds are stored offline which is also an important security improvement. All sensitive information is disconnected from the internet, split with redundancy, and encrypted (AES-256 standard is used). Next everything is copied to USB drivers. Furthermore, there are paper backups that make Coinbase even more secure. Everything is available in safe deposit boxes around the world. Do you still have any doubts about the safety of buying/selling Ethereum on Coinbase? We have the final argument that will allay concerns: the platform provides two-step verification. The popular security improvement, which is also used in case of our favourite ecommerce platform Magento, is applied to a Coinbase user account. Thus, it is necessary to enter a security code that works for just a limited amount of time and is available on your smartphone only in addition to your username and password. It is also necessary to mention that CSRF attacks are prevented since Coinbase use SQL injection filters and verify the authenticity of POST, PUT, and DELETE requests. A variety of actions on the site is limited and attributes on all models are whitelisted that prevents mass-assignment vulnerabilities. Even a password is checked by the system on account creation and password reset to indicated whether it is strong or not. Now, when you know that buying Ethereum on Coinbase is safe, we can proceed to the next part of our Coinbase review dedicated to a user account. For further information on security, follow this link: Coinbase Security. 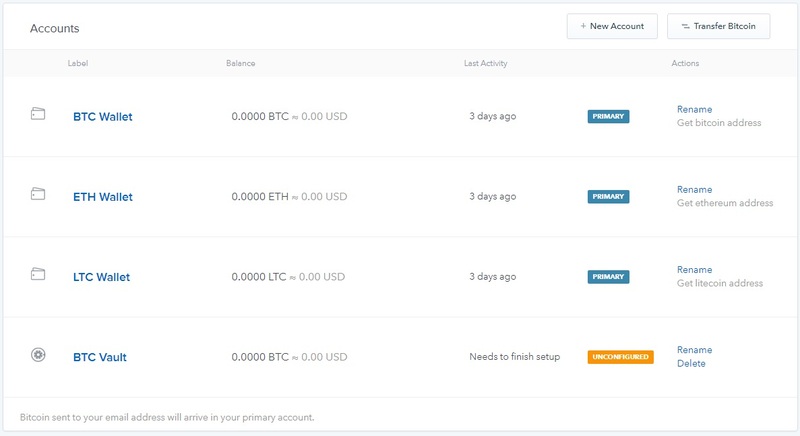 To buy Ethereum on Coinbase, you should register a user account. Right after the registration, you get a digital currency wallet for storing your Ether or other crypto. Next, enable the ability to buy Ethereum with credit card – connect it to your account. Achieve your goal – purchase some Ethereum! So, let’s see how to register a customer account on Coinbase. Enter your credentials to log in to your Coinbase user account. This is a place where you can buy Ethereum with USD or other currency. The account is divided into 6 tabs: Dashboard, Buy/Sell, Send/Request, Accounts, Tools, and Settings. Besides, there is a dropdown menu on the top right with the following items: Your Profile, Contact Support, Invite friends (and get $10), and Sign Out. Let’s describe each tab first. This tab is divided into 3 sections: Dynamics of Prices, Recent Activity, and Your Portfolio. The first one is divided into 3 tabs as well: Bitcoin, Ethereum, and Litecoin. Let’s take a look at the second one. It display the current Ethereum price right in the tab title. Click on the tab, select a period (1H, 1D, 1W, 1Y, or All), and see how Ethereum price changed during the selected period. Besides, the tab shows price behavior in comparison to the same previous period. As for the Recent Activity section, it displays the latest transactions. In Your Portfolio, you can view the total balance, as well as the amount of Ethereum, Bitcoin, and Litecoin and their value in USD. Now, we should explore the last tab – Settings. 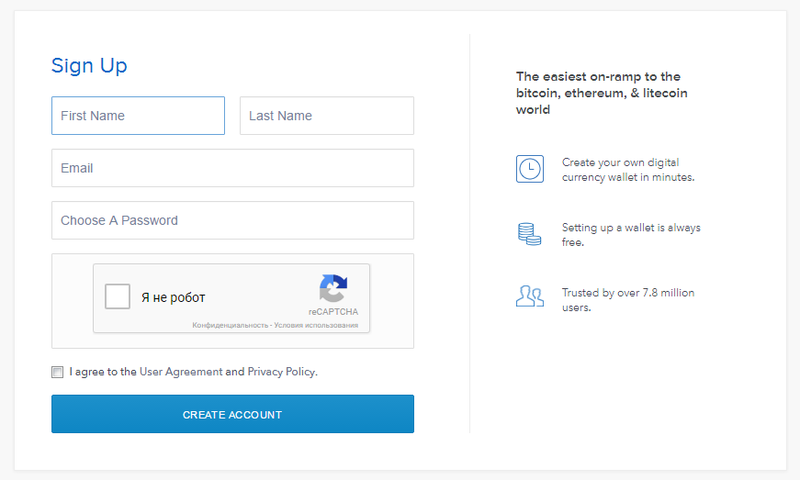 Here, you can configure your Coinbase account in order to buy Ethereum. 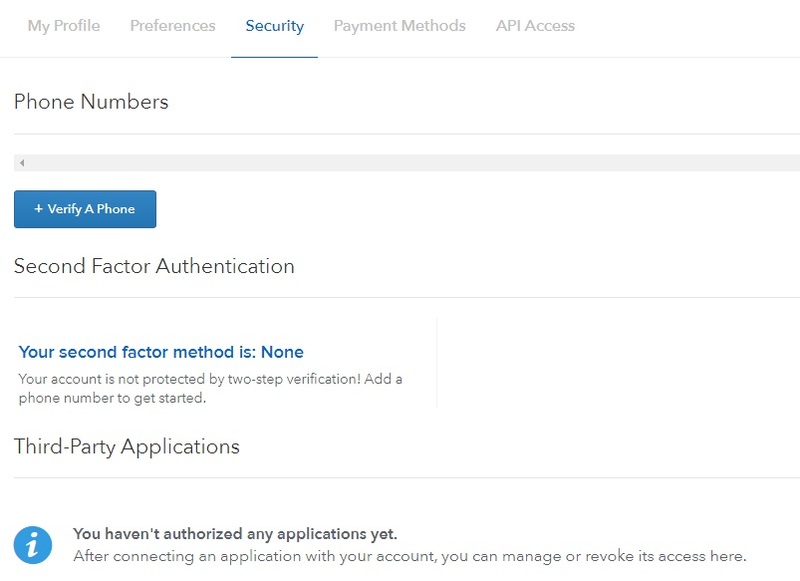 The Settings tab is divided into 5 sections: My Profile, Preferences, Security, Payment Methods, and API Access. In the first section, you can upload a profile picture as well as change your current password, nickname, and email. 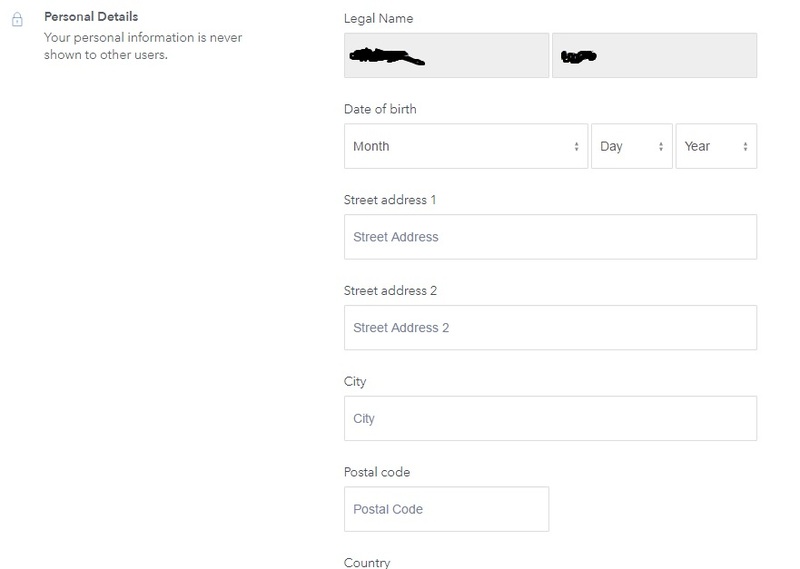 Besides, there is a section with Personal Details that allows to view legal name provided during the registration (can’t be changed) and address data. 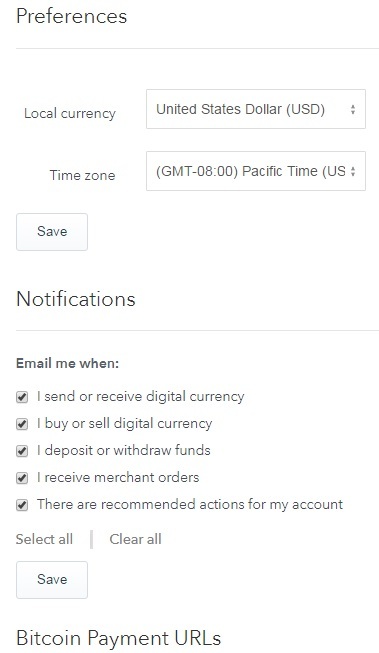 In Preferences, select currency and timezone and enable/disable email notifications for sending/receiving Ethereum and other digital currencies on Coinbase, buying/selling Ethereum and other digital currencies on Coinbase, depositing or withdrawing funds, receiving merchant orders, recommended actions for my account. Besides, it is possible to set up Coinbase to handle all bitcoin payment links on the internet by adding a link handler to your browser. In Security, verify your phone number and enable two-factor authentication. Besides, it is possible to authorize applications there. 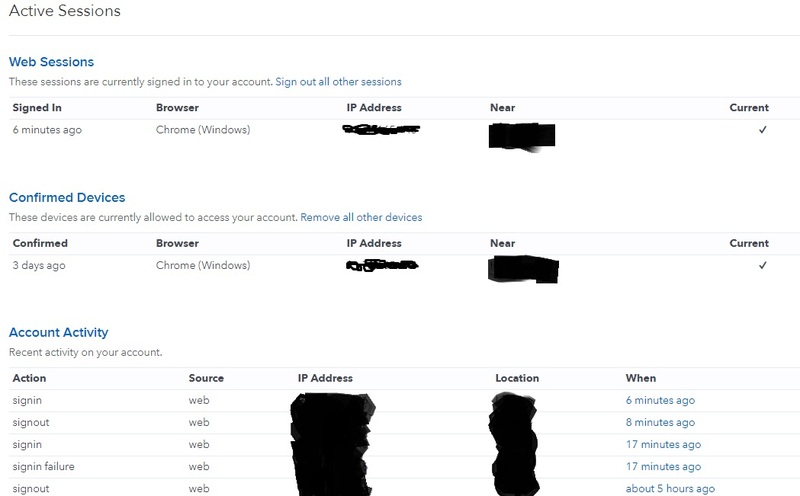 A Coinbase user account allows to view web sessions, confirmed devices, and account activity. All data is gathered in corresponding grids in the security Section. Besides, you can close your account – this cannot be undone. Don’t forget to withdraw funds before closing it. In Payment methods, provide all the necessary information to unlock the ability to buy Ethereum with credit card. 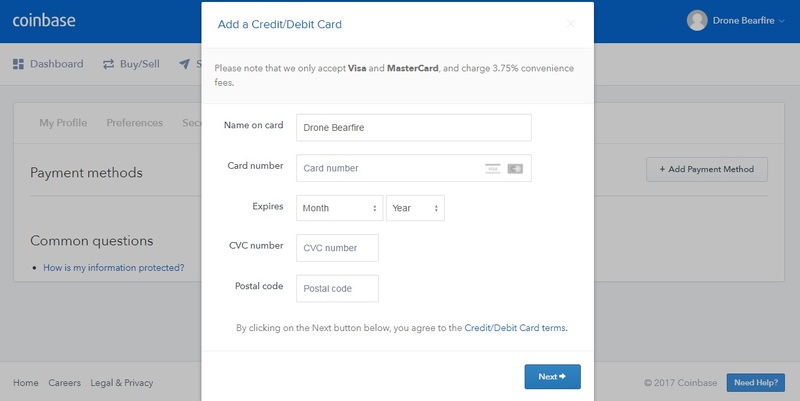 Type your credit card data to link it to your Coinbase account. Note that the platform accept Visa and MasterCard only. The convenience fee is 3.75%. Available payment methods depend on the country of your residence. As for wallets, they are all gathered under the Accounts tab. You can make your Ethereum wallet primary, get Ethereum address, or rename the wallet. The last tab described in our Coinbase review is Tools. It is divided into 4 sections: Addresses, Recurring Transactions, Reports, and History. Your Coinbase account contains a collection of addresses, which are automatically generated for each payment and stay associated with your account forever. Thus, you can safely reuse them. The Addresses Section allows to filter out the selection of addresses by specifying the currency and address or label. Besides, you can create a new address. 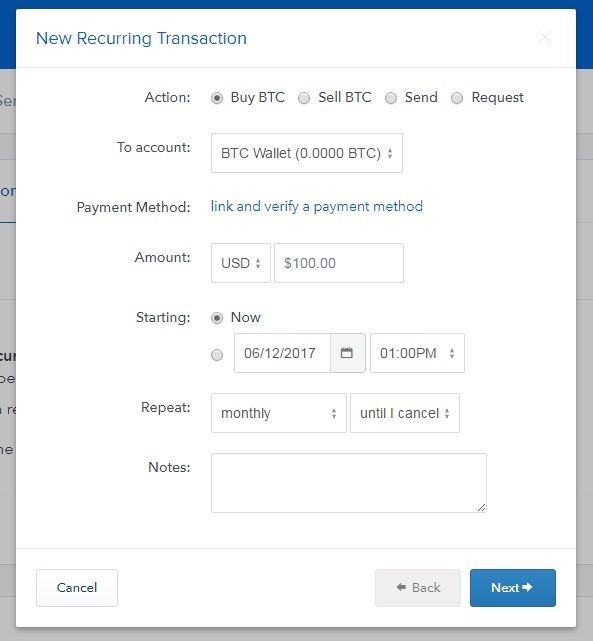 The Recurring Transactions section allows to buy and sell crypto on a regular schedule, pay bills or rent, and schedule payments in the future. 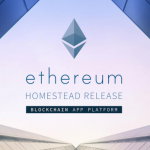 Unfortunately, the tool is not available for Ethereum, but you can freely use it with BTC. 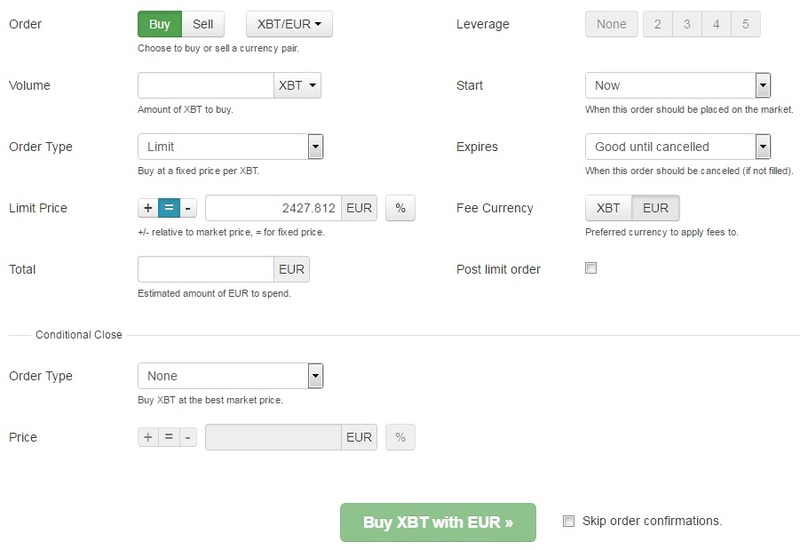 To create a new report, go to the Reports section of the Tools tab, click + New Report, select its type (Transaction history, Merchant order history, Merchant order subscriptions, etc), select account (ETH, BTC, or LTC), specify time range, and type email address to send corresponding information to. Click Create Report. The History section displays all transfers. Since we didn’t provide all the necessary information, this section was blocked. Let’s finalize our Coinbase review. Below, you can find information about supported countries, available payment methods, and fees. Supported Cryptocurrencies: Ethereum (ETH), Bitcoin (BTC), Litecoin (LTC). Professional Ethereum Trading: Yes – via Global Digital Asset Exchange (GDAX). Supported countries: 32 countries. Note that it is only possible to buy Ethereum in some countries right now. For instance, You can both buy and sell Ethereum in Singapore, but only buy it in Australia or Canada. Payment Methods: available payment methods also depends on the country of your residence. Usually, it is Bank Account, Credit/Debit Card, or Deposit. Fees: Standard Buy / Sell – 1.49%; Credit / Debit Card Buys – 3.99%; Bank transfers (SEPA) – in / out – Free / €0.15. As you can see, Coinbase is an absolutely secure platform that allows you to sell/buy Ethereum. Conditions vary depending on the country of your residence, so pay attention to various fee and supported payment methods. But what about competitors? Let’s see what Kraken provides. Kraken exists since 2011. Now, it is the biggest Bitcoin exchange in euro volume and the first one to have trading price and volume displayed on the Bloomberg Terminal. And it allows to trade Ether! So if you are looking for a safe and reliable place to buy Ethereum, create an account or read our review to make the right decision. Below, we describe the platform in the closest details. It is not surprising that Kraken takes a comprehensive approach to security. All wallets are isolated from internet systems, making customer data secure from hackers. These wallets contain deposits and the vast majority of coins. There is also a limited amount of coins stored stored in semi-cold wallets. In their turn, these wallets are stored on protected machines with locked drives. As for online wallets or hot wallets, they are used for coins necessary to maintain operational liquidity. 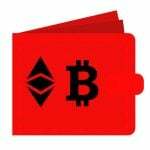 Both types of wallets pass the encryption. Looks similar to Coinbase, isn’t it? And another feature that was just mentioned is two-factor authentication. In case of Kraken, it can be leveraged for account login as well as funding, trading, and procedures that can be performed via API keys. All sensitive account information is encrypted. The same is about verification documents. As for Kraken’s servers, they are saved in a very secure place with armed guards, video surveillance, and retina scans. Another security layer is provided with Cloudflare. The platform protects Kraken from DDoS attacks. 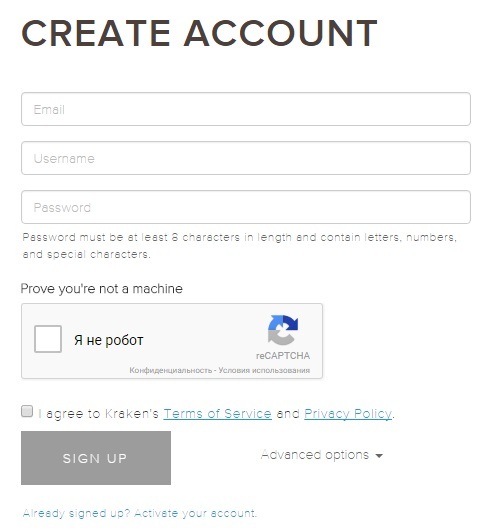 For further information about security, visit this page: Kraken Security Practices. The platform has a complicated verification procedure. 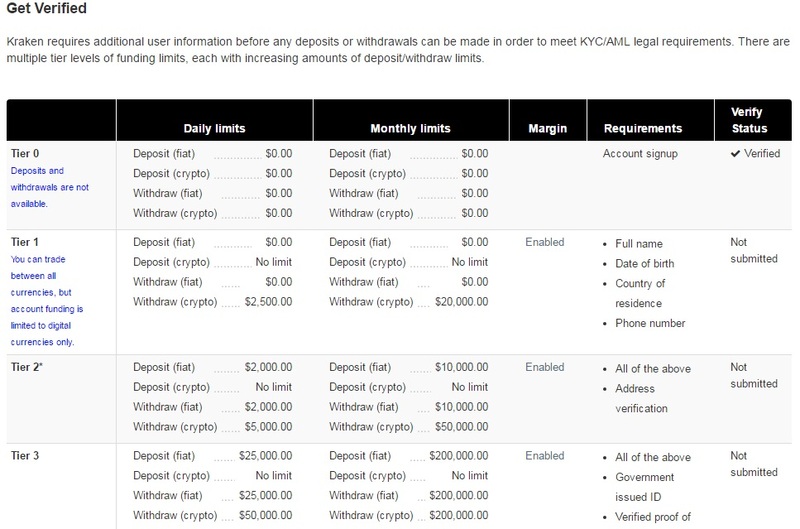 There are 4 tiers that require different user information necessary to meet KYC/AML legal requirements. When the information is provided, checked, and confirmed, you can buy Ethereum or withdraw currency. Tier 0 is a stage when you register a new account – deposits and withdrawals are prohibited. Tier 1 allows you to trade between all currencies, but there is a limit on account funding – only digital currencies are allowed. Tier 2 allows to create a fiat deposit and withdraw fiat, but there is a daily limit of $2,000. The corresponding monthly limit is $10,000. Tier 3 increases deposit and withdraw amount for both fiat and crypto. Tier 4 is a corporate account. 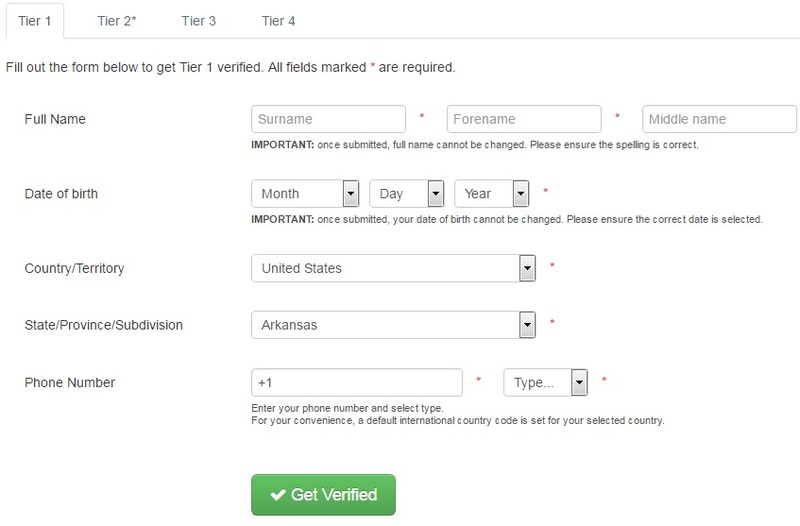 And this form should be filled in in order to verify your account for Tier 1. Specify your full name, date of birth, country, state, and phone number. Select a currency pair and the following information will be displayed: last price, highest price, lowest price, 24 hour volume, and weighted average. Open the Trade tab. It looks less user-friendly than one available on Coinbase, but Kraken is a serious trading platform, so user experience here is related to features and functionality. Visual appearance is on the second place. The tab contains the following sections: Overview, New Order, Orders, Positions, and Trades. The Overview section contains several elements: Balances, Rates, Trade Balances, Position Valuation, and Ledger. The New Order section is a place where you can buy Ethereum with USD. There are three algorithms: Simple, Intermediate, and Advanced. Let’s see how the first one works. 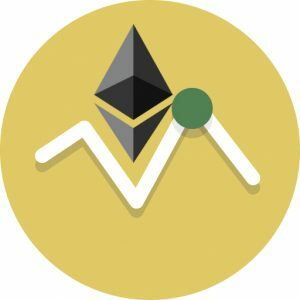 Set the amount of ETH to buy, specify a fixed price per ETH to buy Ether, and type an estimated mount of USD to spend. The same parameter should be specified to sell Ethereum. 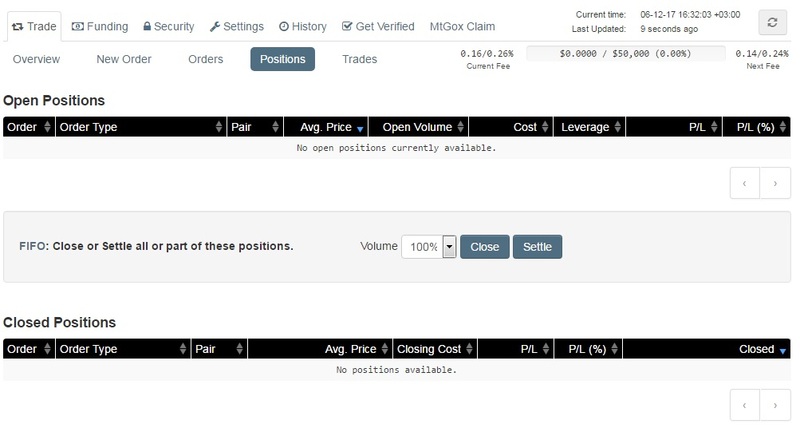 Also note that the section contains three tabs: New and Open Orders, Positions, and Order Book. All orders are gathered in the appropriate section as well. There are two grids here: New & Open Orders and Closed Orders. The functionality of the Funding tab is limited for Tier 0, but it is a place where you can deposit or withdraw to/from your account. Besides, it is possible to perform audit and increase funding limits here. 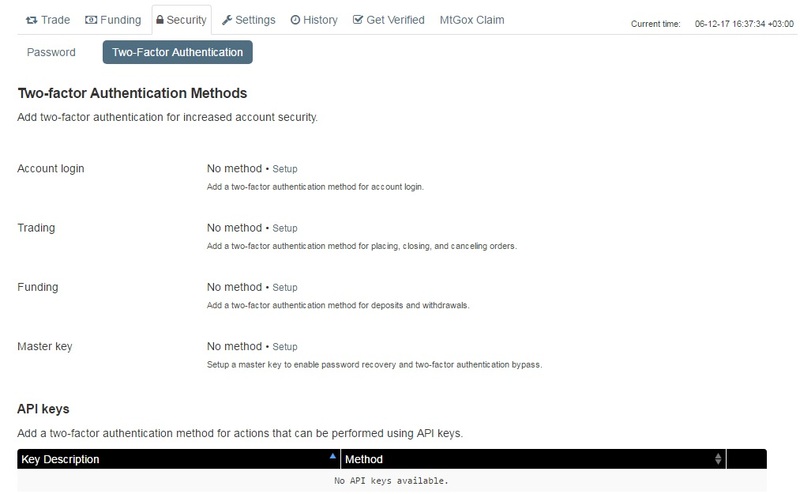 The Security tab allows to change the existing password as well as setup two-factor authentication for account login, trading, funding, master key, and actions performed via API. 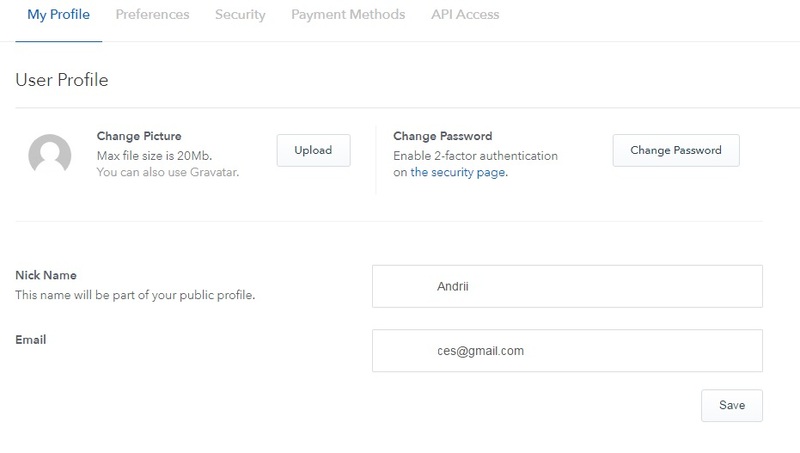 In Settings, you can configure various account information, notifications, and API. 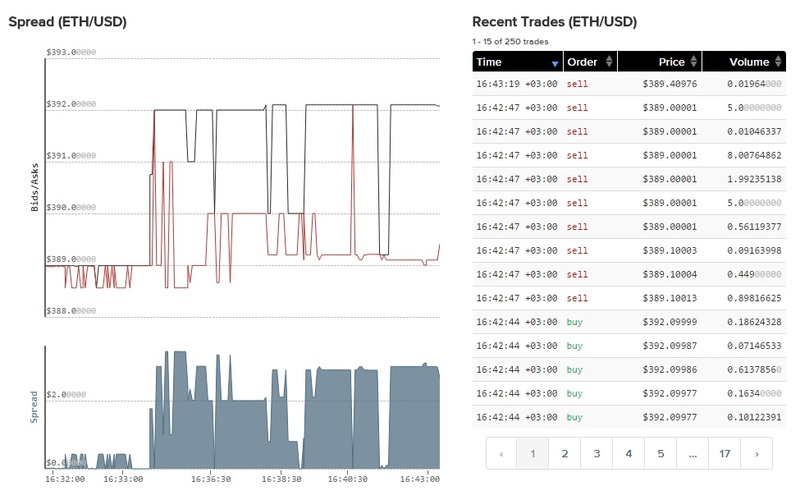 The History tab provides 4 logs: Ledger, Orders, Trades, and Export. All information is available in corresponding grids. You can apply filters to narrow down the selection. Below, you can see some other important features of Kraken as well as our short conclusion. Supported Cryptocurrencies: Ethereum (ETH), Bitcoin(XBT), Monero (XMR), Litecoin (LTC), Dash (DASH), Ripple (XRP), Ethereum Classic (ETC), Stellar/Lumens (XLM), Augur REP tokens (REP), Melon (MLN), ICONOMI (ICN), Zcash (ZEC), Tether (USDT), Dogecoin (XDG), and Gnosis (GNO). Retail Exchange: Possible, but has more professional purposes. Professional Ethereum Trading: Yes, Tier 4. Payment Methods: Wire transfer is supported. Deposits via credit card, debit cards (in most countries), PayPal, or similar services are not accepted. Fees: fees depend on volume. 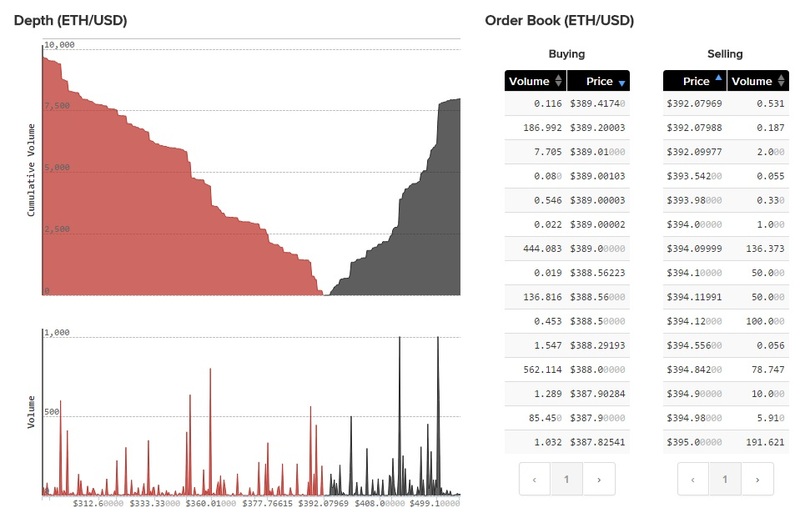 For the ETH/USD pair and the volume less than 50k – the Maker fee is 0.16%, and the Taker fee is 0.26%. The more total volume you trade, the lower your fee on subsequent trades is. You must admit that Kraken is much more complicated than Coinbase. It provides lots of trader-specific features that are not necessary for someone who just want to invest into Ethereum. Besides, it has a complex verification procedure that can also frighten some customers. But professional traders are welcome! 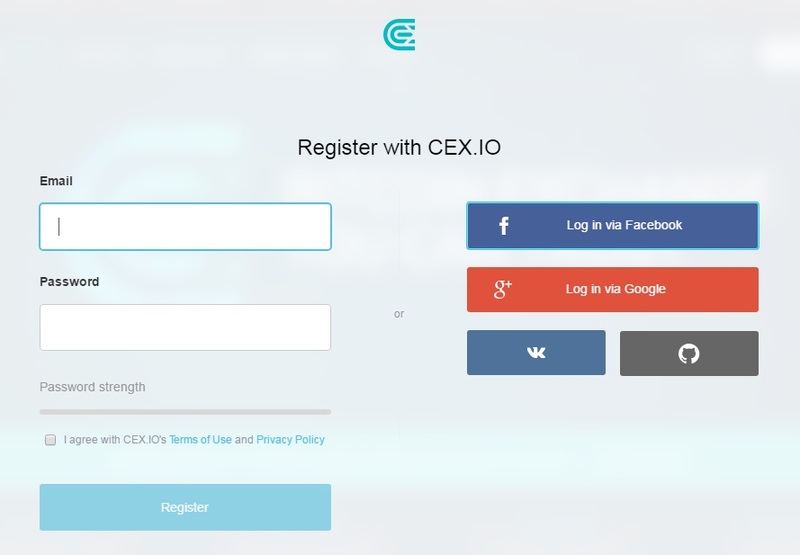 Established in 2013, CEX.IO became the first cloud mining provider that turned into a cryptocurrency exchange where you can easily buy ethereum with credit card or other payment methods. CEX.IO is not as popular as Coinbase with its 8 million users, but it already helps over half million people get access to high liquidity orderbook for top currency pairs. Due to a user-friendly interface and top-notch functionality, CEX.IO is good for both Ethereum beginners and institutional traders. Also note that the platform has worldwide coverage and provides multiple payment options, so maybe this is the best place for you to purchase Ether? Stability and security are among the highest priorities of CEX.IO. As the aforementioned trading platforms, it offers two-factor authentication, data encryption, and cold cryptocurrency storrages. Besides, CEX.IO is compliant with SSL and PCI DSS certificates and has strong relations with banks. The platform is absolutely safe to trade on. Furthermore, none of its customers ever experienced account funds theft! Another step towards buying Ethereum is credit card verification. The process is described in the smallest details on CEX.IO, so we will only cover some key aspects. In order to buy Ethereum with credit card, you should verify your VISA, MasterCard, or any virtual card. 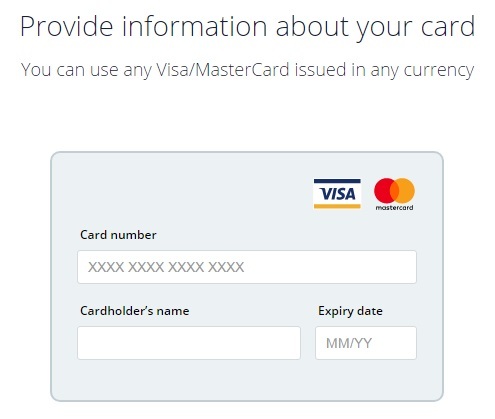 Provide card data: cardholder’s name, card number, expiry date. Prove your ownership: upload a selfie with a payment card. If you hate selfies – choose another trading platform (two more are described below). Provide CVV/CVC number and complete standard verification by small charge amount (less than $1.00) submitted to your payment card issuer. Since a CVV/CVC number is note stored on CEX.IO due to security reasons, you have to enter it manually every time a payment is made. The last step requires entering the charged amount from the previous step. Contact your bank or check your online payment card statement. 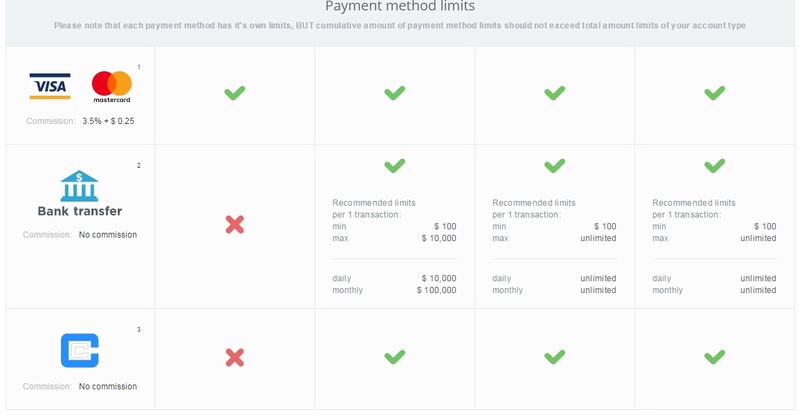 You can extend limits and enable more payment options by verifying your identity. Now, you are ready to buy Ethereum on CEX.IO, so let’s explore core elements of a customer account. Spoiler: you will be impressed how user-friendly the platform is. The first section we’d like to draw your attention to is called Buy/Sell – just like in case of competitors. The section is divided into two parts: Buy and Sell. To purchase Ethereum, select the first one. Here, You can switch between Ethereum and Bitcoin, as well as select a fiat currency to purchase crypto. The available fiat currencies are: USD, EUR, GBP, and RUB, but you can use them to purchase Bitcoin. In case of ETH, CEX.IO allows you to use USD, EUR, or BTC (yes, you can buy Ethereum for Bitcoin). When these two parameters are specified, you can invest $100, $200, $500, or $1,000 into Ethereum. The amount of Ether is calculated automatically depending on the current exchange rates. 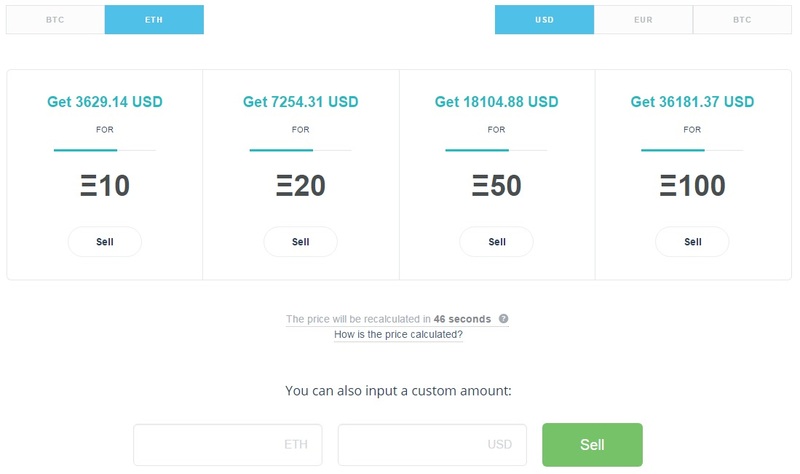 Alternatively, you can input a custom amount of ETH and CEX.IO will automatically calculate its price in the selected currency. At the same time, CEX.IO Ethereum exchange allows to sell ETH. The interface is the same as we’ve just described. You select a crypto you’d like to sell and specify fiat currency or crypto you’d like to get. You can get USD, EURO, or BTC for ETH. It is possible to sell fixed amount of Ethereum (10, 20, 50, or 100) as well as specify a custom qty. Note that your current balance for USD, EUR, ETH, and BTC is displayed above the page on the left from Deposit and Withdraw buttons. 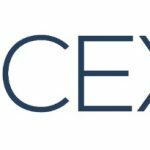 CEX.IO Ethereum exchange offers 3 deposit payment methods: Payment card, Bank transfer, and Cryptocapital. Note that while buying Ethereum with credit card, the deposit limit is $300 and there is a commission – 3.5% + $0.25. The calculator will automatically count the total amount necessary to place a deposit. In case of Bank transfer and CryptoCapital payment methods, no commission is charged. 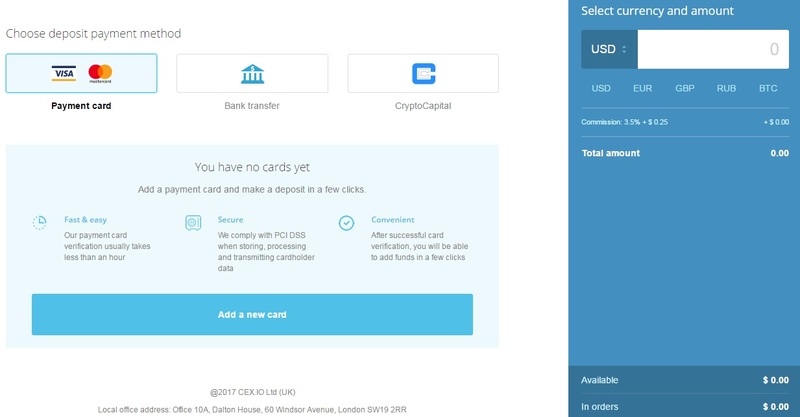 The same payment methods are available for Withdrawal: Payment card, Bank Transfer, and CryptoCapital. For payment cards, you can withdraw only $500 per day and $2,000 per month. The limit will be increased after you pass further identity verification. The commission for withdrawal to a payment card is $3.80. In case of a bank transfer it is a fixed amount – $50. And if you prefer withdraw to CryptoCapital, get ready to spend 1% of withdrawn funds for the commission. 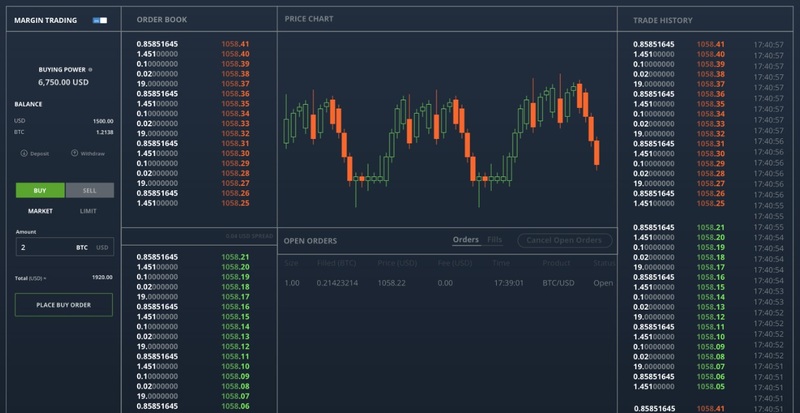 Trade is a section where you can view the behaviour of currency pairs: BTC/USD, BTC/EUR, BTC/GBP, BTC/RUB, ETH/BTC, ETH/USD, ETH/EUR/ and GHS/BTC, and trade Ethereum. You can view charts for 1, 3, 5, 15, or 30 minutes, 1, 2, 4, 6, or 12 hours, 1 or 3 days, and 1 week. Last price, daily change, today’s open, and 24h volume are displayed above the chart. Below, there are three tabs: Limit, Market, and Margin trading. 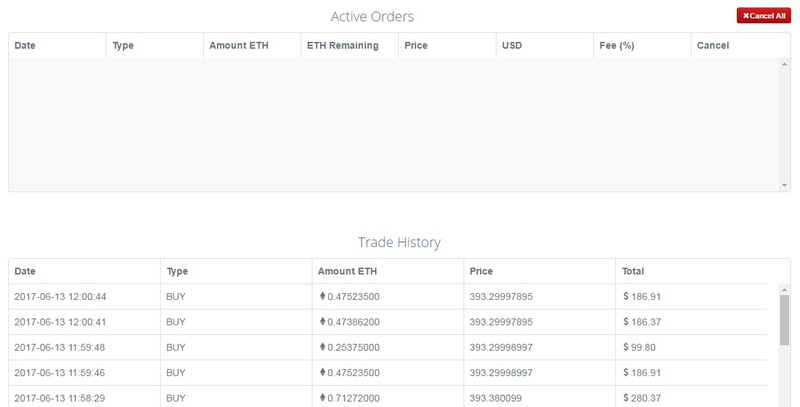 Under the Limit tab, you can find two forms: Buy ETH and Sell ETH. Specify amount to buy or sell and price per ETH. Click “Place order”. Below, you can see two grids with sell and buy orders. There are two more grids available on the page: Active Orders and Trade History. The Market tab has a similar structure, but there are two slightly different forms: Instant buy ETH and Instant sell ETH. In the first one, specify the amount of USD to spend and an estimated ETH amount. As for the second form, set the amount of ETH to sell, and specify an estimated USD amount. 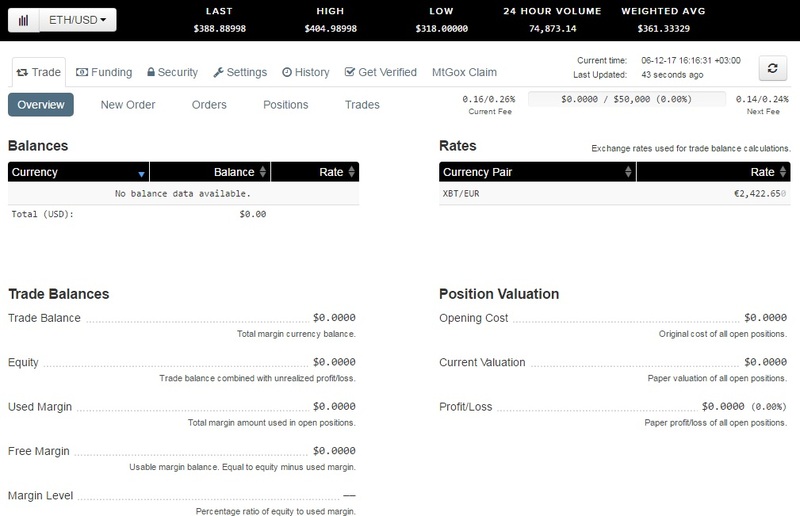 The finance section of the CEX.IO Ethereum Exchange account is divided into 5 tabs: Balance, Transactions, Achieved orders, Margin trading, and Limits and Commissions. 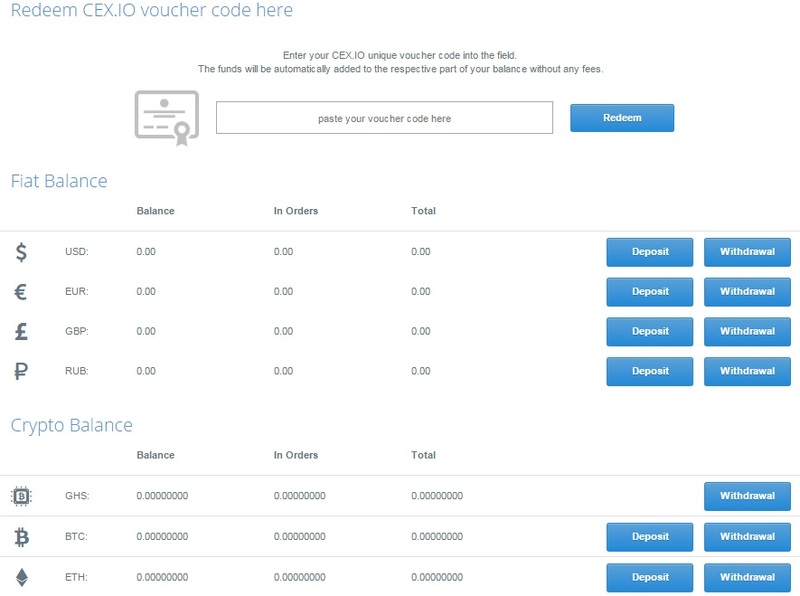 The first tab allows to enter a CEX.IO voucher code to add funds to the respective part of your balance automatically without fees. Nextm there is a grid that displays your fiat balance for USD, EUR, GBP, and RUB. You can deposit or withdraw each currency here. Crypto Balance is displayed below as well. Here, you can deposit and withdraw Ethereum and Bitcoin. Under the Transactions tab, there is a grid that contains all transactions performed from your account. You can apply several filters to narrow down the selection. First of all, there is a currency filter where you can select Ethereum. Next, it is possible to specify a transaction type: All transaction types, Deposit, Withdrawal, Trade, Margin Trade, Referral, and Mining. The last filter is designed to apply a certain date range to the Transactions grid. Thus, CEX.IO provides the ability to view all operations related to Ethereum for a certain period of time. In Archived Orders, you also have a grid. This time, it allows to filter out the selection by currency pairs, time periods, and statuses. In Margin trading, the available filters are: All pairs, All position types, and time range. Limits and Commissions provides an overview of account opportunities. There are 4 account types: Basic, Verified, Verified Plus, and Corporate. 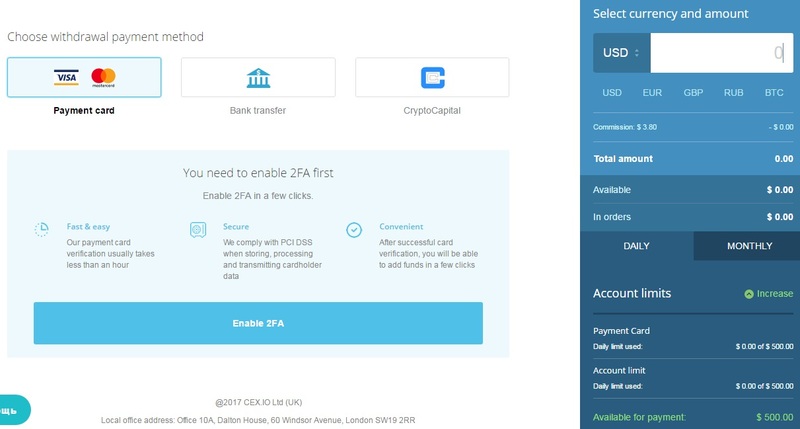 Above, we’ve described that you only have to verify your credit card to start buying and selling on CEX.IO. This is the main requirement for a basic plan. You can start verification for more advanced plans right under this tab. For instance, the Verified Plus account has no limits on withdrawal and deposit. As for a corporate account, you can use it for your enterprise enjoying custom conditions. For users who don’t want to invest into cryptocurrencies or trade with fiat, CEX.IO provides the ability to earn money with the help of the affiliate program. Invite users to the platform and start earning 30% of the fee on their exchange transactions. Simply generate your unique referral link and provide it to friends. Besides, you can create landing pages and use banners. There is also a section with stats related to the affiliate program. Now, let’s summarize what we know about the CEX.IO Ethereum Exchange. Supported Cryptocurrencies: Ethereum (ETH), Bitcoin(BTC). 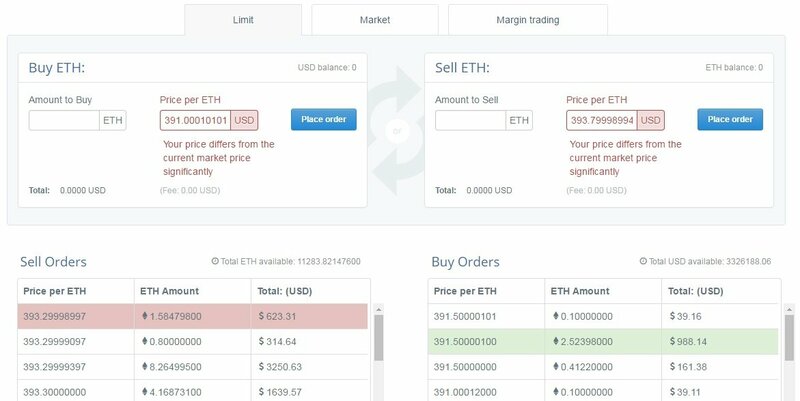 Retail Exchange: Highly user-friendly interface..
Professional Ethereum Trading: All the necessary trader-oriented features.. Supported countries: No restrictions for visa; view limits here. Payment Methods: Payment card, Bank transfer, and Cryptocapital. Fees: Deposit: 3.5% + $ 0.25 for payment cards; no commission for other payment methods; Withdrawal: $3.80 for Visa; 1.2% + $3.80 for MasterCard; $50 for Bank Transfer; 1% for Cryptocapital. In comparison to the aforementioned Ethereum exchange platforms, CEX.IO provides the most intuitive and user-friendly interface. Furthermore, it combines simplicity with feature-rich experience. CEX.IO provides the ability to simply buy Ethereum with credit card with minimized verification procedure. If you need more features, you can pass further verification. At the same time, the platform allows to leverage complex trading features. Can we tell for sure that CEX.IO is the most user-friendly Ethereum exchange? Let’s explore other popular platforms before making any conclusions. We’ve just mentioned above that Coinbase provides the ability to trade Ethereum professionally via GDAX. It’s a completely different platform with trader-oriented features. 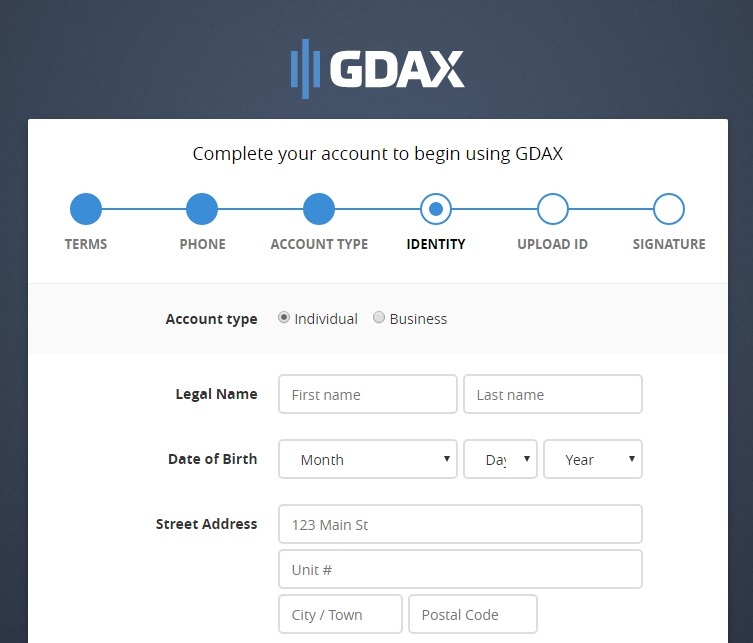 GDAX offers the ability to trade a variety of digital currencies on a regulated US-based exchange. And in the following GDAX review we explain it’s core features and opportunities. Since GDAX and Coinbase are just different parts of the same system, the security features of GDAX are similar to ones we’ve just described in our Coinbase review. Even the security statement link on the GDAX website redirects you to the already familiar page on Coinbase. To buy Ethereum on GDAX, you must create a new customer account. Luckily, you can essentially simplify this procedure by using your credentials from Coinbase, but there are 6 more steps to complete the account. You have to verify your phone number and identity. Since the platform is developed especially for professional traders, and we’ve created this post to explore places where you can buy or sell Ethereum without any headaches, we won’t explore core elements of a customer account. Just note that GDAX acts as Kraken but with a slightly more modern interface. The work on the platform is partly based on transfers between your Coinbase wallets and GDAX account. These transfers are instant and free, and you can send unlimited deposits to GDAX. As for withdrawals, they have a restriction which is based on your exchange withdrawal limit. The maker fee is 0%, the taker fee depends on the currency pair and a volume of trade. For instance, for ETH/USD and user 30 day volume between 0 and 1% of total exchange 30-day volume, the taker fee is 0.3%. Professional Ethereum Trading: with advanced trader-oriented features. Supported countries: US, Europe, UK, Canada, Australia, and Singapore. Payment Methods: via Coinbase account. Fees: taker fee from 0.3% and less; maker fee – 0%. GDAX is a part of Coinbase where professional traders buy Ethereum. It doesn’t support as much currency pairs as Kraken, but provides a more user-friendly interface, so if you are going to trade Ethereum, Bitcoin, and Litecoin only, you may choose this exchange, but note that it has some limitations in comparison to Kraken. Gemini is another digital asset exchange that allows to buy Ethereum. Being based in new York, it is regulated by NYSDFS and complies with all modern requirements. 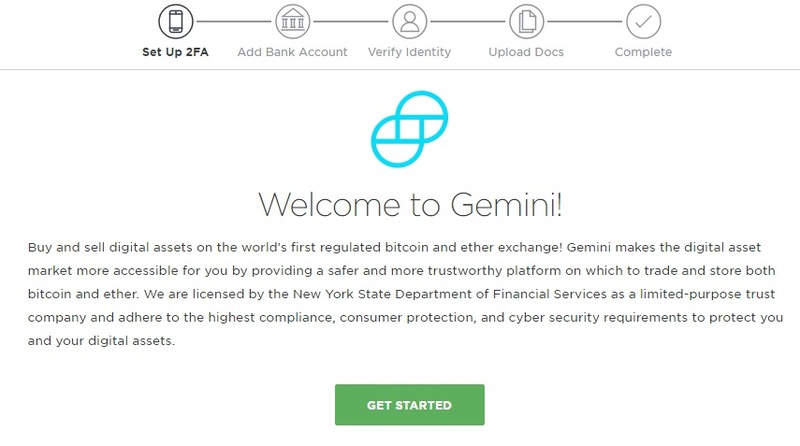 Gemini allows both individuals and institutions to trade digital assets. The platform provides the ability to buy Ethereum and Bitcoin with USD. Besides, you can purchase Ethereum with Bitcoin. The same is about selling. Furthermore, Gemini allows to deposit and withdraw USD, BTC, and ETH. Gemini uses a cold storage to provide the maximum possible security for your digital assets. A so called hot wallet is used for just a small portion of digital assets. Note that it is hosted on Amazon Web Services providing an extra layer of protection. The cold storage system is based on two tiers of offline. The first one is dubbed “cold” and the second is “cryogenic”. This increases the existing security level even more. Two-step authentication is also used in the system. In addition to session login, you can add it to such processes as funds withdrawal. Password control system engages all customers create only strong passwords. And there is a product data encryption system. For further information about Gemini security, follow this link. 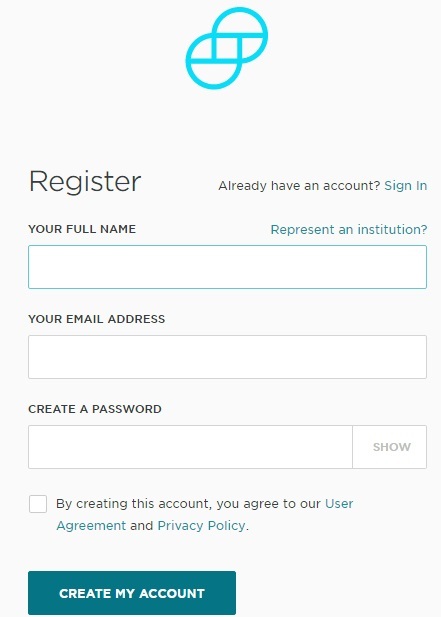 Specify your email address, full name, and password to create a new customer account on Gemini. Next, you have to set up two-factor authentication, add a bank account, verify your identity, and upload docks. Only after completing this complex procedure, you will be able to trade on Geminy. You must admit that CEX.IO is the most user-friendly platform. Because of the complex registration, we didn’t get inside the platform, but there are interesting facts about Gemini. First of all, it doesn’t charge any fees. Deposit, withdrawal, and market data connections are completely free. Gemini supports US Dollar wire transfers from banks. 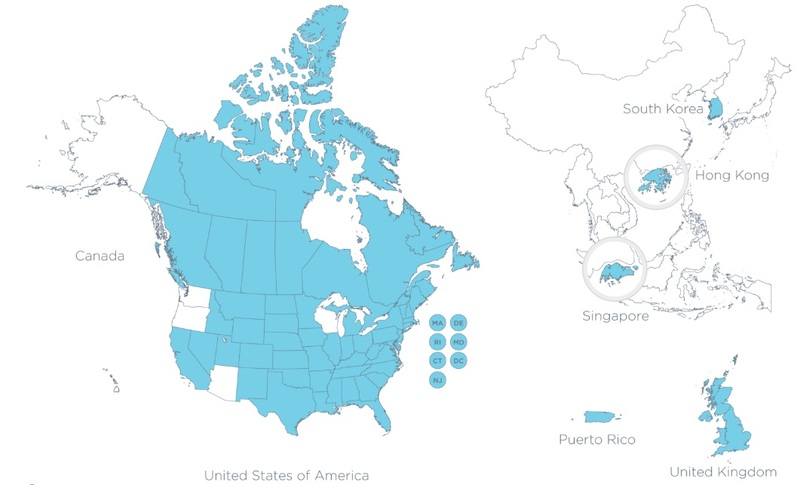 The platform operates in the following countries: Canada, US (not all states are supported), Hong Kong, Singapore, South Korea, and United Kingdom. Perhaps, Gemini is the most closed Ethereum exchange when it comes to the ability to explore it without passing through the whole verification procedure. Does it make any sense? Yes, but we think that such platforms as CEX.IO has much more chances to attract new visitors, who can explore the full potential of the platform without spending several days on providing all the required information. Let’s summarize what we know about the Gemini Ethereum Exchange to make a conclusion. Supported countries: Canada, US (not all states are supported), Hong Kong, Singapore, South Korea, and United Kingdom. Payment Methods: Bank wire transfer. So, what can we tell about Gemini? It is for sure a secure exchange where you can fully leverage your trading potential. It seems that Gemini is not the best place for buying selling Ethereum if you are an average person who wants to invest into this cryptocurrency, especially because of a long registration and verification. If you are a trader and you operate from a supported country, feel free to streamline the potential of the platform trading Ethereum and Bitcoin. Now, when you know where to buy Ethereum, we should describe what platforms are suitable for what customers. Note that the aforementioned exchanges are time and community proven, but they different purposes, interfaces, and features. All 5 platforms are extremely secure and rely on similar security measures. Each has its own restrictions, but you can freely buy/sell Ethereum on them, if these restrictions don’t concern you. Thus, CEX.IO combines two platform types: you can freely buy/sell Ethereum there as well as trade crypto. The exchange has the most intuitive interface and user friendly login/registration with the help of social networks. We know for sure that CEX.IO offers the fastest way to achieve your goal. At the same time, there is Coinbase. Perhaps, it is the most popular place for selling/buying Ethereum and other cryptocurrencies. It also has a user-friendly appearance, but a little bit more complicated verification procedure. If you are a serious trader, pay attention to Kraken, since this Ethereum exchange supports lots of currency pairs and many cryptocoins. The interface of the platform is a little bit more outdated, but if your goal is to trade, you will forget about this tiny drawback. What about GDAX and Gemini? Both platforms are alternative solutions to Kracken first of all. GDAX is integrated with Coinbase providing several additional opportunities based on this integration. And Gemini is just another solution aimed at traders. Both look more modern than Kraken, but offers a limited selection of currency pairs. At the same time their potential is enough for trading Ethereum.